Age restrictions: Child ages: 7-16. Children aged 6 and below are freeChildren must be accompanied by an adult (18yrs+) when visiting galleries. Pick up point: Please take your voucher/confirmation to the ticket office along with photo ID for entrance to St. Paul`s Cathedral. The ticket allows access to the entire cathedral. Important info: Disabled Access: For wheelchair users there is a wheelchair accessible entrance for FIT’s and small groups in the South Churchyard. Staff are on hand to assist with entry and check in.Groups of wheelchair users can be admitted by a ramp in the North Churchyard Gardens which allows a quicker entry into the building. Use of this must be pre-booked with the Sales and Administration team to ensure that staff are on hand to open the doors.The Cathedral may from time to time close (at short notice) due to special services of worship. id="cke_pastebin">	From Friday 2 August 2019 through to and including Saturday 31 August 2019 the Cathedral will remain open to visitors for an extra hour. Opening hours will therefore be 8.30am to 5.30pm (last admission 5pm) and last access to the Dome Galleries will be at 5.15pm.In order to gain entry you must present a printed copy of your voucher. 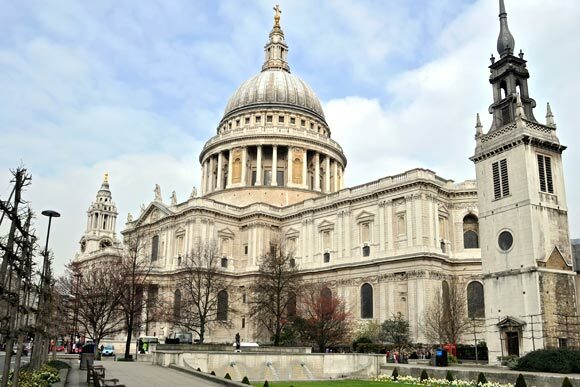 As one of the most iconic parts of the London skyline, with its instantly recognisable dome, St Pauls Cathedral has been welcoming visitors since its completion in 1697, although there has been a place of worship on the site since 600 AD. With its baroque design and fascinating interior the cathedral has been the site of many celebrations including the ending of both world wars as well as the royal wedding of Prince Charles and Lady Diana and the state funerals of Lord Nelson, Winston Churchill and, more recently, Margaret Thatcher. It is hard not be impressed by the many features present from the underground crypts to the Golden Gallery which is situated 111 metres above ground floor. And with a priority ticket you can avoid the queues and explore the whole cathedral, when booked as a package you also get a great choice of quality accommodation at the lowest possible price. Famously designed by Sir Christopher Wren, one of the nation's most famous architects, the cathedral was the tallest building in London until 1962 with a height of 111 metres. There have been places of worship on this site dating back to 600 AD with many being destroyed by fire. St Pauls itself became a symbol of hope during the blitz as although it was damaged the main structure survived, despite the fires that raged through the capital. The Cathedral's crypt is the largest in western Europe and covers the entire length of the building. The whispering gallery has such good acoustics that a whisper against the wall can be heard on the other side 112 feet away.